Are you waiting For Lucknow Metro Vacancy Notification ??? If yes then her is important News for you. 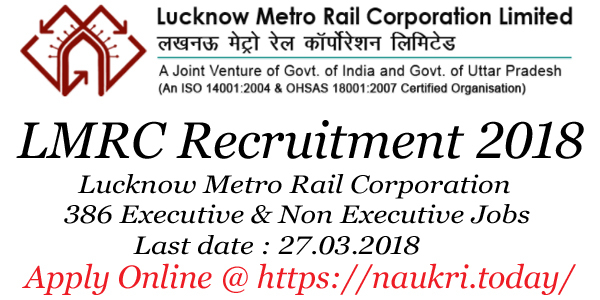 Lucknow Metro Rail Corporation Limited (LMRCL) has issued notification for filling up 386 Executive & Non Executive Vacancies. 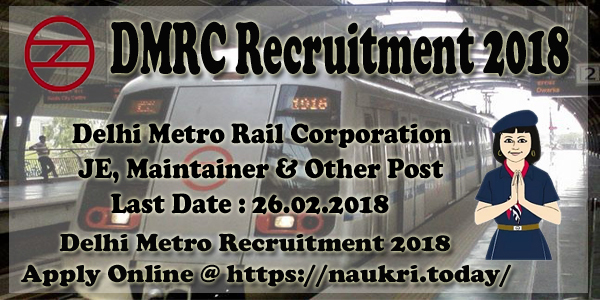 All the Job Seeker who are interested in LMRC Recruitment 2018 can fill online form 386 Lucknow Metro Jobs from here. Closing date for submit online application for LMRC Vacancies is 27th March 2018. More details about Executive & Non Executive Vacancies you can collect from below article. Lucknow Metro is inviting online application for filling up 386 LMRC Vacancies. This is great job opportunity for all the candidates who are looking for LMRC Jobs Notification. Appliers can fill Online application form here, before this candidates must check required Eligibility Criteria. Full details about Eligibility Criteria, Pay Scale, Selection criteria etc. for LMRC Non Executive Vacancies you can check from here, below sections. Latest News as on 24.02.2018 : Filling of Online form for Lucknow Metro vacancies has started now. Interested candidates can submit respective LMRC Jobs online form here, link is available in below section. Latest News as on 23.02.2018 : Applicants, Lucknow Metro has now issued Full Notification of LMRC vacancies & also Started link of filling online form. Link is mention in below article & For more details read the article properly. How I Check Application Fees, Pay Scale & Selection Criteria For Lucknow Metro Jobs 2018 ? How Can I Fill Online form For LMRC Recruitment 2018 – Lucknow Metro Jobs Online Form ? 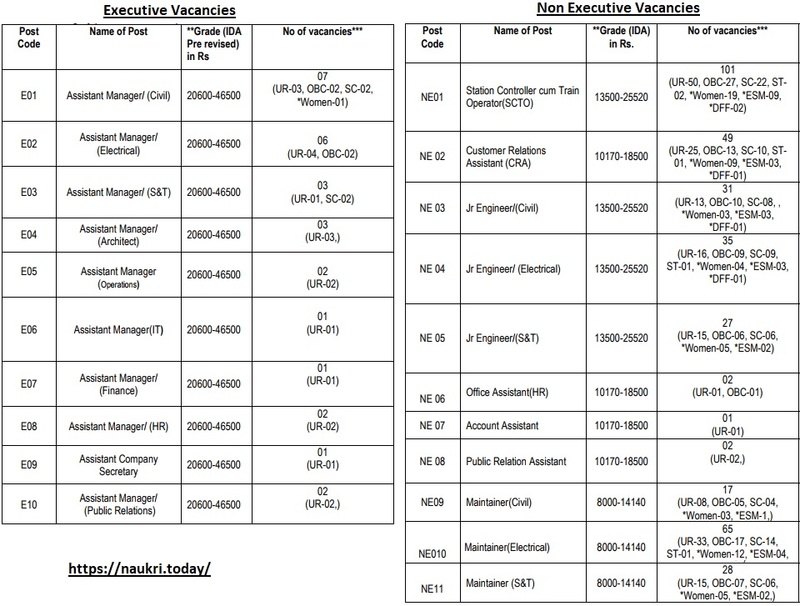 In this section we are providing Executive & Non executive LMRC Jobs Division. Full details about Post wise division will describe after publication of full notification of Lucknow Metro Recruitment. If you are going to fill online form for LMRCL Non executive Vacancies Then check required education & age Criteria From here. Here full details about eligibility criteria for Lucknow Metro Jobs is mentioned. Further details you can collect from notification which is mention below. Candidates must have done ITI/ Diploma/ Degree/MBA in Respective trade with minimum 60% Marks from any recognized University for Lucknow Metro vacancies. More information about post wise qualification you can check from LMRC Bharti Notification which is shown below. Minimum age of the candidate for LMRC Recruitment 2018 must be 21 years & Upper age should be 28 years as on 01.02.2018. Relaxation in age is applicable up to 05 years for SC/ST & 03 years for OBC Category candidates for LMRC Vacancies. Candidates of General./OBC category must paid Rs. 500/- as application fees for LMRC recruitment 2018. Other Candidates of SC/ST category must paid Rs. 200/- as application fees for Lucknow Metro Non executive Jobs. Fees Must be deposit through online mode only. Selection of the candidates for Lucknow Metro Recruitment will based on CBT Exam, Psycho Test & medical Examination. Selected candidates list will prepare on marks obtain in examination. For more information candidates must read LMRC Jobs 2018 Notification. First of all candidates log on to the official website www.lmrc.com. Now click on Recruitment Section & Click on LMRC Recruitment 2018 Notification. Read executive & non executive Jobs Notification. Now deposit application fees in Lucknow Metro Vacancy Online form. Take print out of LMRCL Vacancy Online form for future use. Conclusion : LMRC Recruitment 2018 For 386 Executive & Non Executive vacancies. Apply online form for Lucknow Metro Vacancy on or before the last date 27.03.2018. More information you can collect from official LMRC Notification or by reading the above article.